Night diving, if you have never heard of it, it might sound strange, right? 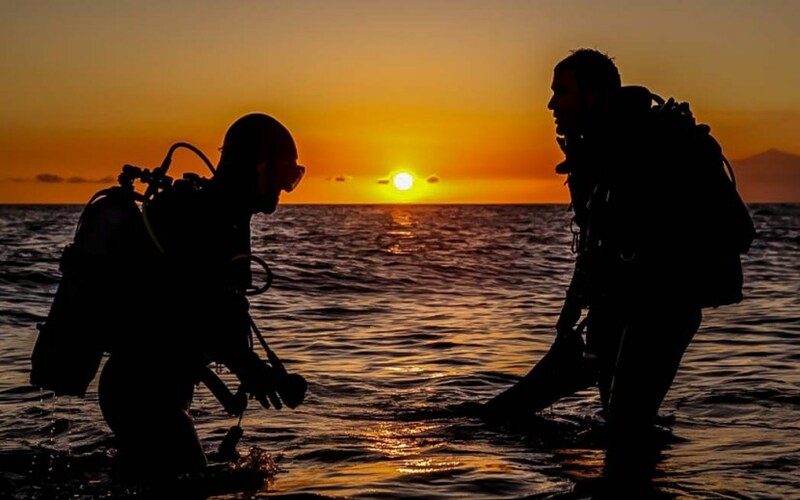 Guess what, scuba diving after sunset is one of the most exciting experience underwater. It is very different from diving at daytime. Aquatic life changes completely at this time: in the underwater scenery, most of the fish are replaced by invertebrates. Feelings are different: scuba divers see only what they light with their flash lights. Going by night gives unique sensations, but you need to choose a great place with lots of interesting things to spot. Sometimes, people fear about going on their first night dive, but once they are down underwater, they quickly realise they are hooked on it. So, what is really happening by night? Why scuba divers are so hooked about it? What is the good behaviour to have underwater? Most of the fish are sleeping at that time, but other critters awake. These are mostly invertebrates. Cuttlefish, octopus, shells, nudibranchs, Spanish dancers, eels, lobsters, crabs, hermits, shrimps, rays, seahorses, and a lot more. All of them are really awake, even hunting. The underwater life at night time is simply so different and very active. Where can you dive in Bacuit Bay? With El Dive, you can night dive in 3 of our usual sites: NatNat, Paradise, or Helicopter. If you previously dived by day, you probably won't be able to recognize the site. It looks so different. Departure is around 5:30pm, so the boat gets to the dive site 20 minutes before the sunset. Enjoy a break with a coffee, cookies. Don't forget your camera: most of the time, the sunsets are incredible. - A backup flash light. - A strobe light on your surface marker buoy. - Being an Open water diver (or Junior OW) from 12 years old, doing the NIGHT Adventure in Diving with a PADI instructor. If you are looking for some more information about our Advanced Open Water courses, please click here. - OR, being an Night Adventure in Diving, going for a fun dive with a divemaster. For more information about fun diving, please click here. - OR, being an Advanced Open Water diver, going for a fun dive with a divemaster. - Make a complete buddy-check. Make sure the batteries of the flash light are fully charged. - Make a slow descent making sure to keep a distance from everyone and to keep the flash light down so you see the bottom. - Debrief with your divemaster or instructor at the dive shop.